A wedding is arguably the most stressful event you can ever organise in your life, unless it’s one related to business. Considering everyone you know is going to attend your wedding, organising the schedule carefully is imperative to assure everything goes perfectly. 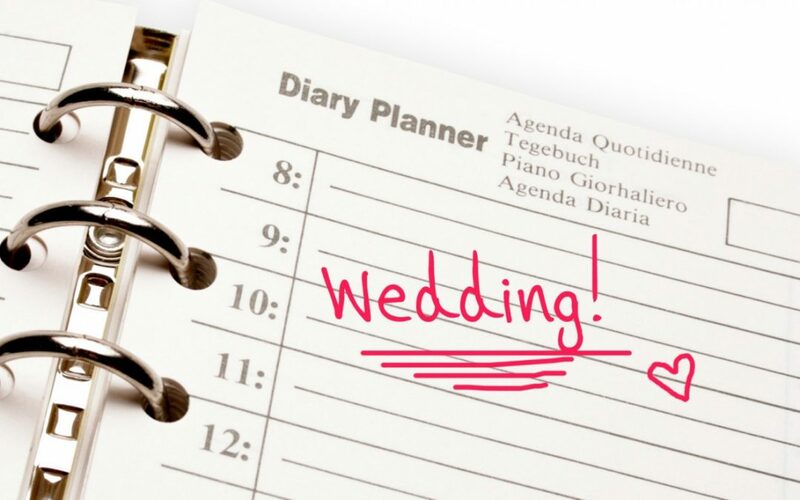 Here are some tips on Planning your Wedding Schedule for a Sydney Wedding basic Timeline. It’s easy to overlook details, especially with so many elements involved. The key is to put together a schedule outline long in advance to formulate everything. While you may alter this slightly later, you’ll know what things you can realistically do from early morning prep on through to the evening reception. Don’t forget about how important wedding entertainment is on your schedule. A wedding singer or Sydney wedding band should become a prominent part of your ceremony for interactivity. Most wedding experts say you should start doing your hair and makeup by 10 a.m., including trying on your wedding dress. Perhaps you want to start even earlier, especially if you want more time experimenting with the type of makeup or hairstyle you’ll wear. All of this applies to a traditional schedule, unless you want to do a morning/early afternoon wedding. Next, make some phone calls to assure everyone is going to arrive at the venue at the appropriate time. Allow some “me” time in the morning hours. Nevertheless, it’s a good idea to get it all done by noon so you can greet the vendors at the venue. Allowing two hours to work with the vendors at the venue is a smart idea before guests arrive by mid afternoon. When a wedding singer or band arrive by noon, this gives them time to get situated and do a sound check. It’s a good idea to sit in on this with your wedding planner to assure the acoustics work well and the set list is appropriate. Talk directly with your wedding entertainers about the type of songs they’ll perform. You’ll also want to talk to them about what songs they’ll play when you and the groom do your first dance together in front of everyone. You’ll want to hire a wedding photographer who can take photos of you getting ready, including of you putting on your wedding dress. Even a “first look” portrait of you and your groom can become an important milestone. Of course, this only applies to breaking tradition in seeing one another before the ceremony begins. To keep people energised, have your wedding singer or band play music as guests arrive and before the ceremony begins. This gets people psyched up for the post-ceremony party in the hours to come. Make sure to feed your wedding entertainers with a meal before they start performing since they’ll have to keep their energy up until evening. Don’t hesitate to use your wedding entertainers for the ceremony music to consolidate things. A well-versed entertainer can play traditional wedding music as well, then expand later to play anything related to your theme. This includes contemporary hits if you so choose. Music is going to become a major part of keeping people entertained after the ceremony. With nothing else to do but eat and drink, guests want other interactive elements to keep things interesting. A quality wedding singer or band knows how to handle these situations so it’s not overwhelming, or underwhelming. Find out what songs your guests prefer hearing to keep the set list meaningful. You’ll want to get everyone on the dance floor after dinner to keep things fun. This is going to mean a wedding band that knows dance songs best representing your heritage. Perhaps you’ll want traditional dance music in this regard. In other cases, a quality performer can easily sing your favorite contemporary dance hits if you have a mostly younger crowd. At Lily Road, we’re one of the top booking agencies for wedding entertainment throughout Sydney. If planning a Sydney wedding, visit us to learn about how we can supply you the best wedding entertainers in the industry.